Digital Crystal Manufacturing (DCM) seeks to digitise the making of sculpture/crystal artefacts by allowing artisans to reuse molds as well as facilitating the shipping processes of crystal sculptures. Digital crystal manufacturing will leverage on different technologies such as 3D scanning and it will easily allow to copy existing statues “on demand”. Thanks to DCM, once the object/statue becomes a 3D file, it can be sent and managed very easily and without any cost, whereby paving the way to the digital artists of the future. The history of Nuova CEV crystal factory dates back to the 40’s. 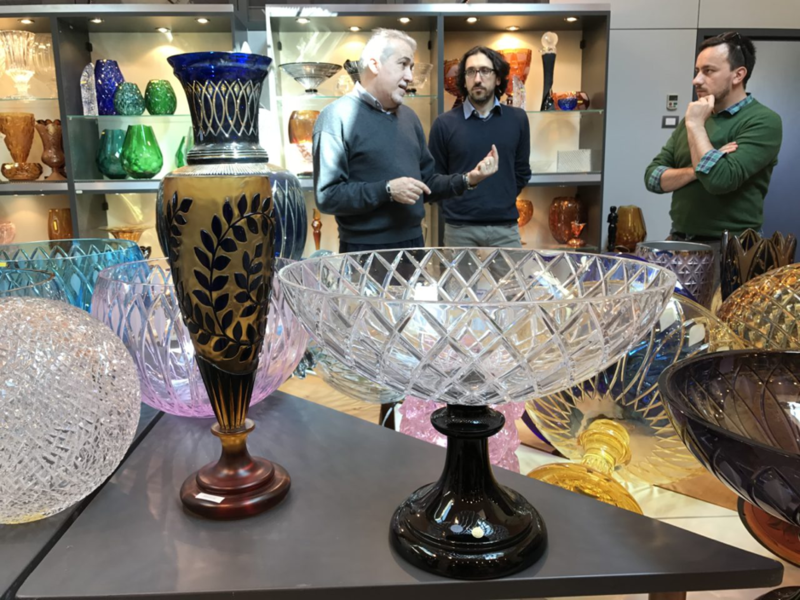 From 1945 up to the present day, Nuova CEV has been perpetuating the long-standing tradition of the master glassworkers in forging hot, fascinating living matter: crystal. Over the years, Nuova CEV has been manufacturing plain as well as coloured and transparent glass, including the renowned “opaline”, while in the 1970s and 1980s it started producing lead crystal. Nuova CEV was the first company in the area of Empoli and Valdelsa to experience new production techniques such as the glass-washing robot and the semi-automatic stamping machine, and one of the first companies to use state-of-the-art equipment for cold work of manufactured goods, the so-called “glass stoning”. Fablab Contea is a place open to anybody willing to study, experience, develop and enjoy digital projects and knowhow. Our dream is to transform the lab into a 2.0 library, where books and knowledge can be shared, together with the use of our softwares and machineries. What are the main strengths and challenges of a maker-manufacturer partnership? Both partners have to willing to learn, absorb, study and risk something. The aim is to get to an experimentation that has the chance to give an additional value to the company to better face the future. Meeting experts and professionals who want to find new solutions becomes a journey in a whole new world to be discovered. This can create a great opportunity both for companies and makers. The biggest achievement would be to make crystal an accessible material (economically sustainable) for digital makers and traditional craftsmen. Crystal would become a common material for many different kind of fabrications, just sending a simple digital file. Making the crystal modelling process cheap and simple is one of the main challenges we aim to tackle. We would love for the OpenMaker experience to strengthen our connection with local companies. We think that the active interaction between them and the makers from our community would be a great opportunity for our development. Finally, as part of the maker movement, do you have any funny anecdote? Being used to work with digital technology, when we first entered Nuova CEV, we got really impressed with the manual work and by the handcrafted details of the statues. Focusing on this postproduction work, even analysing them in detail, we hardly found automatised alternatives to their productions…we realised that it is simply impossible to substitute the precious handcrafting process!